Escape the city and enjoy a mountain getaway to the Castle in the Rockies. Few hotels in the world can rival the majesty, hospitality and scenery of Fairmont Banff Springs. Its unique blend of opulence and seclusion has been a symbol of Rocky Mountain magnificence for more than a century. Styled after a Scottish baronial castle, Fairmont Banff Springs offers stunning vistas, championship golf courses, unparalleled skiing, classic cuisine and Willow Stream, a world class European-style spa. Experience timeless beauty and luxurious comfort in a pristine wilderness. Fairmont Banff Springs offers all the amenities of a world-class resort, with 764 guest rooms and suites, superbly appointed Banff accommodations and attentive, personalized service. 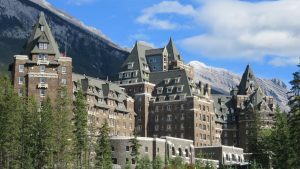 From cozy rooms tucked away in quiet corners of the castle to spacious suites with sweeping Alberta mountain views, Fairmont Banff Springs, Banff Canada hotel has the perfect guest room, suite, or Fairmont Gold accommodations for your Rocky Mountain getaway.